Those of us in the field of Prolotherapy owe a great debt to Dr. Tom Dorman, whose work and dedication to the field of Prolotherapy and Orthopedic Medicine paved the way for many to follow. We mourn his loss, but celebrate his life and life-work. The following is a memorial written by Dr. Richard Gracer. I was shocked and dismayed, as were all of us who knew him, to hear of the death of my dear friend and colleague, Thomas Dorman, MD on March 10, 2009 at the age of 72. Tom was one of the most influential and important persons that I have had the honor to know. The news sent me reeling and back to many memories of the times and events that we shared. I cried, and between the tears I felt his presence, as I often do. When I see a difficult patient or come across an ethical dilemma, Tom is in my thoughts. He had an invariable scientific honesty and moral compass that often helps to see the best course of action. Many know his name, but may not really know who he was and what he stood for. Many have read his prolific writings and have gained from his insights, but may not know where they came from or the thought process behind them. Tom was born in Kenya, while it was still under British rule. His father was a coffee merchant. When Kenya gained its independence, Tom’s family moved to Israel. He was in the Israeli army in a paratroop unit during the 1956 war. He attended the University of Liverpool and although his father wanted him to be a businessman, he then went on to medical school in Edinburgh. He moved his family to Canada where he began practice as an internist and cardiologist. In 1978 he moved to San Luis Obispo on the central California coast where he practiced until 1996 when he moved to the Seattle area to work with Jonathon Wright, MD at the Tahoma clinic. A few years later Tom opened the Paracelsus Clinic in Federal Way, Washington were he practiced until his death. Those are the facts, but there is much much more. While practicing cardiology Tom often saw patients with chest pain that was neither cardiac nor gastrointestinal. The diagnosis in these cases can often be obscure. Tom searched for other causes and found that many of these patients had musculoskeletal pain. He studied with James Cyriax, MD, the late British physician who is considered by many to be the “Father of Orthopaedic Medicine.” Dr. Cyriax developed a systematic diagnostic method to quickly and reliably find the exact tissue source of musculoskeletal pain. This study started Tom on his life long interest in furthering our understanding of and treating these problems. Tom became interested in ligaments as a source of tissue pain, a much overlooked problem. 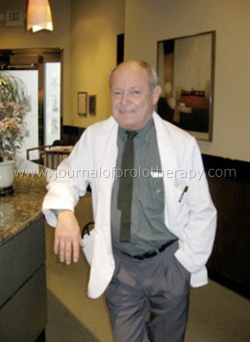 In 1994 Tom, with important contributions in radiology from Tom Ravin, MD, published his textbook, Diagnosis and Injection Techniques in Orthopedic Medicine on Prolotherapy. This was the first book that combined Cyriax’s orthopedic principles with the treatment of ligamentous problems. Tom is not only famous for the concepts he developed, but for his logical methods and his amazing ability to “connect the dots.” He saw patterns that everyone else missed. I would often have an “aha” moment when I would think about what he would tell me. When Tom and I taught orthopedic medical courses together, I often learned more than the students. Tom was well-known within the orthopedic medical community as an exceptional physician, as well as a pivotal thinker, writer and teacher. He had a majestic command of the English language. He also was a major thinker in the preventative/nutritional medicine arena. In fact, he introduced me to this whole area of medicine, and he influenced the orthopedic medical community to shift their thinking to include this vital area. Besides all of this, Tom was a well-known libertarian thinker and writer. He held strong beliefs in personal freedom and independence. He decried the invasion of insurance companies in medical decisions and never accepted insurance payments. He opposed any governmental control over medical practice. He used alternative medical therapies when he thought that they were the best treatment for his patients. He was the consummate physician. Tom is survived by his wife of 38 years, Alison, four children – Jill Coletti, Michael, Andrew, and Erin Hadley, and six grandchildren – Jill’s Benjamin and Joshua; Michael’s Mackenna and Micaela; and Erin’s Zoe and Sam. The family has asked that those who wish to honor Tom make a donation to the Ludwig von Mises Institute in his memory (http://mises.org/). Tom Dorman was a great man. He was my colleague. He was my teacher. He was my friend. God rest his soul.